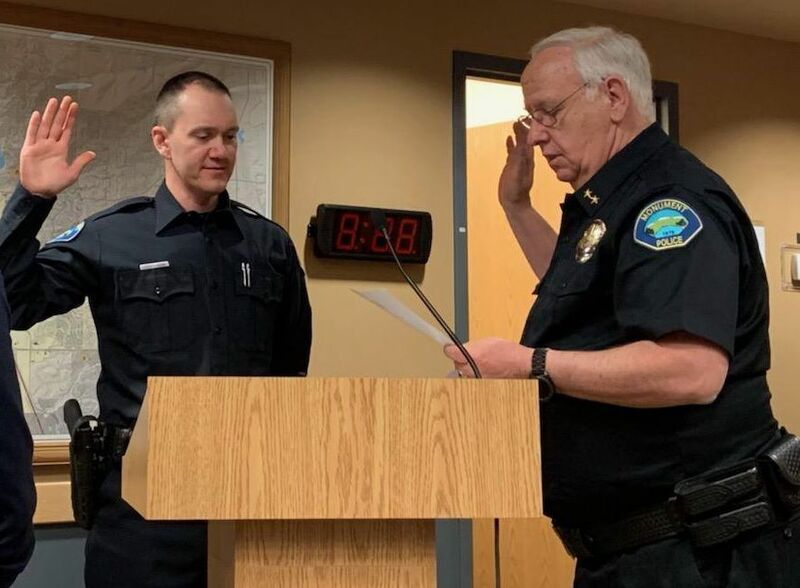 Monument Police Chief Jacob Shirk, right, administers the oath of office to new Officer Greg Melikian at the April 1 Board of Trustees meeting. Shirk spoke against the red flag bill during last week’s meeting, saying it would be challenging for local police to enforce. In March, El Paso County commissioners unanimously passed a resolution declaring the county a “Second Amendment Preservation County,” in opposition to the red flag gun bill in the Colorado Legislature. Last week, the Board of Trustees declared Monument a "Second Amendment Preservation Town." Kent Jarnig,chairperson of the El Paso County Colorado Progressive Veterans, supports the red flag law. He spoke during last week's Board of Trustee's meeting in support for stricter gun regulations, which he says is influenced by his experience as a combat medic in Vietnam. At last week’s regular meeting, the Board of Trustees voted unanimously to proclaim Monument as a “Second Amendment Preservation Town.” This decision was in direct response to a controversial bill to prevent gun violence, which some argue would strip Coloradans of their constitutional right to own firearms. Police Chief Jacob Shirk spoke against the red flag bill that would require law enforcement to seize firearms from people who are deemed hazardous to either themselves or others. Not every seizure is as simple as knocking on a door, Shirk explained. Tactical support, such as a SWAT team, may be required when taking firearms from those who are considered armed and dangerous. In those situations, he said, extreme caution is needed to keep police officers safe. Shirk said this lack of tactical support in his department could prevent him from carrying out the judge’s order to seize the firearms. While he said he wouldn’t willingly violate a judge’s court orders, he said the law is in direct conflict with people’s Second Amendment rights. If accused gun owners cannot convince the court that they are not a threat, their firearms could be confiscated for as long as 364 days. Monument Police Department has limited storage space and may not be able to store the weapons for that long. The Colorado House of Representatives approved the bill on April 1. The bill has had a deeply polarizing effect, with more than half of Colorado’s 64 county governments opposing the bill. Under the law, judges could issue court orders that would require police officers to seize firearms from someone perceived as a threat. The gun owners would have the chance to defend their rights to own firearms during a court hearing. Shirk said the law unfairly places the burden of proof upon gun owners. The proclamation approved at last week’s town hall meeting states that the law fails to solve mental health problems at the root of gun violence. There are already procedures in place to deal with people who are armed and planning to commit violent acts, Shirk said. Those who pose an immediate threat to themselves or others are placed in custody for 72 hours, during which they are evaluated by a mental health professional. Kent Jarnig, the chairperson of the El Paso County Colorado Progressive Veterans, supports the law. His support for stricter gun regulations is influenced by his firsthand experience as a combat medic in Vietnam. “I’m aware of what an M-16 does when you shoot somebody in the head,” Jarnig said during the town hall meeting. Allowing dangerous people to own firearms could have deadly consequences, he said. Some who oppose the law argue that judges are not qualified to assess the mental health of gun owners. Jarnig disagrees, and said this reasoning doesn’t give judges their due credit. Fourteen other states have approved similar legislation restricting gun ownership. Wilson sees the board’s proclamation to preserve Second Amendment rights as a show of support for the Monument Police Department and the El Paso County Sheriff’s Office, both of which oppose the law.